Ko-fi - New! Use Ko-fi for Commissions - Ko-fi ❤️ Where creators get paid by fans, with a 'Buy Me a Coffee' button. Thousands of creators use Ko-fi for commissions. We listened to your feedback and created "Ko-fi Commissions" to make it easier. With Ko-fi Commissions fans can buy unique, original work just for them. 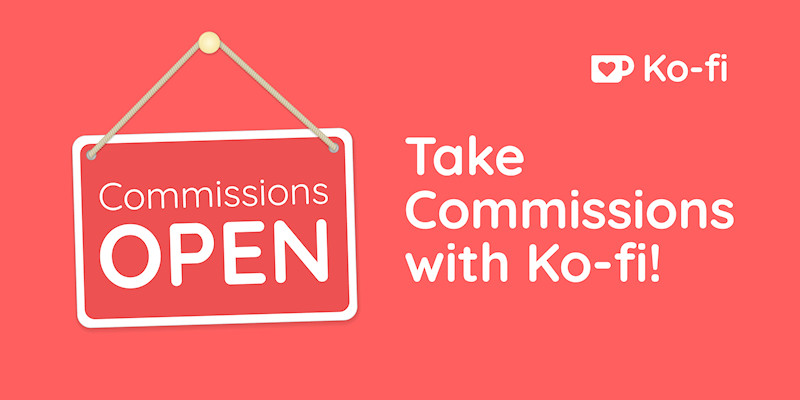 Display your commissions status, create a menu of commission options, show available slots, take the info you need to start the work, set your terms and get paid directly and upfront with no fee from Ko-fi. Display commission status - Let fans know when commissions are open/closed and automatically close commissions when all your slots are full. Create a commissions menu - Offer different commission types with descriptions, prices and example images to clearly show fans what they are buying. Show available slots - Let people know how many slots are available and when you are sold out! Set your terms – Make sure buyers know and accept your terms upfront. They can’t commission you until they accept them. Get the info you need – Collect the details you need to start the commission. Characters, reference material, scene descriptions. Anything you need. Send/receive confirmations – An email is sent to the buyer and the creator when a commission is ordered containing all the details you agreed. Get paid directly & in advance – To complete a commission request the buyer pays you directly via PayPal so you don’t have to start work until you receive the money. Contact the buyer – Buyers leave their contact information so you can finalise details, query descriptions and deliver the finished work! You can find out even more about Ko-fi Commissions in this help article. We took the guidance of lots of Ko-fi members before creating Ko-fi Commissions. Special thanks to Monarobot and Joey Mac for their input. This is just the beginning for commissions and we need your feedback. If Ko-fi Commissions is missing an important feature for you or you have ideas on how we can make it better we really want to hear from you. Ko-fi Commissions is part of Ko-fi Gold. We are eternally grateful for everyone who tries Gold, you genuinely are helping us build a better Ko-fi and we can't run the platform without you!